363/365 – “Meet Shadow” nr.29, a photo by Luca Rossini on Flickr. Twenty ninth day of “Meet Shadow”. Dinner time. 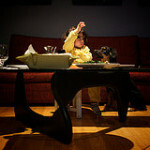 Agata sits at the coffee table, on her little chair, eating her food while watching a few cartoons. Ombra sits right at her side, close enough to look at what’s on Agata’s dish, fork, hand and mouth. Ombra is a well behaved puppy, which means she won’t try to steal Agata’s food right away. That doesn’t mean she doesn’t steal, however. It’s more like she follows an unwritten rule which states that after a certain amount of time in which the food stays idle on Agata’s fork or hand at Ombra’s nose height the food shall belong to the dog. The problem is, cartoons tend to hypnotise Agata, and a spoonful may remain in mid air long enough for Ombra to decide it’s her turn to have a bite. All of which brings at this picture, the current equilibrium. Agata keeps her food high enough to be out of Ombra’s reach, while Ombra stays focused to check if Agata’s hand lowers enough for the unwritten dogs’ rule to be finally applied.